Brief Description: Spurs fans beware! And be prepared to challenge your knowledge (and possibly be demoralised at your lack of it!) about your favourite team. The 1,250 questions in this quiz book cover every aspect of Spurs’ long history, including players, managers, opponents, scores, transfers, nationalities, seasons, League positions, Cup competitions, and much more. And don’t pat yourself on the back too soon, as there’s an ‘Experts’ section at the end, designed to defy the most ardent aficionado’s powers of recollection. 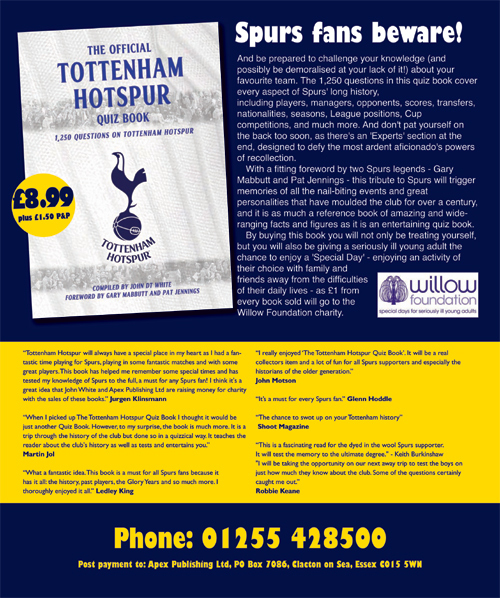 With a fitting foreword by two Spurs legends – Gary Mabbutt and Pat Jennings – this tribute to Spurs will trigger memories of all the nail-biting events and great personalities that have moulded the club for over a century, and it is as much a reference book of amazing and wide-ranging facts and figures as it is an entertaining quiz book. By buying this book you will not only be treating yourself, but you will also be giving a seriously ill young adult the chance to enjoy a ‘Special Day’ – enjoying an activity of their choice with family and friends away from the difficulties of their daily lives – as £1 from every book sold will go to the Willow Foundation charity. Special Note: £1 from every copy of the book sold will go to 'The Willow Foundation' Charity. 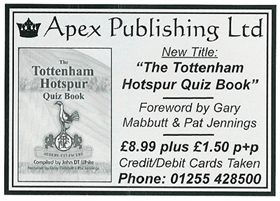 Questions from this book were used in the 'AllAboutFootball' Official Tottenham Hotspur Edition board game. This book is also available as an ebook. I'm a bit of a statto but there were a few things to stump me in here. Even better, there are plenty of chances to smile while remembering former favourites you might not have thought of for a while. An excellent collection of teasers for Spurs fans old and new. Never mind Pele and Maradona, this book is for those who remember Alfie Conn as the most exciting player they ever saw. The best of John's quiz books I have the pleasure in owning! Superbly presented and researched! A must for soccer and Spurs fans! A true test for all Spurs fans, fun for all the family. A must for any Spurs fan, a great read. A good range of questions for a varied age group - would certainly highlight the true fan from the armchair bandwagon fan! As a Spurs fan, I was in little doubt that I had an all-encompassing knowledge of all things Tottenham Hotspur matched by no one. It was evident after a couple of pages of The Official Tottenham Hotspur Quiz Book that like good old Sergei Rebrov himself, I could not live up to the hype. The book has been meticulously put together and covers every detail of the grand old club, big and small. A perfect companion while sitting in the icy stands before a winter’s game at White Hart Lane and a great addition to any coffee table for impromptu quiz sessions. Entertaining and educational – it’s rare those two words make happy bedfellows, but John White has managed it. This book is a must for all Spurs fans. With a great variety of questions and teasers from past and present it suits both young and old. 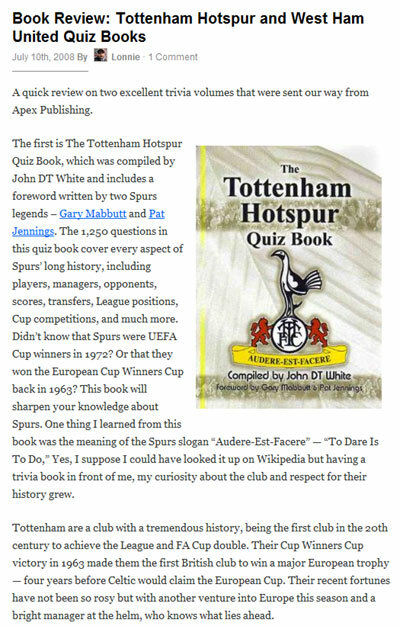 We are delighted to write the Foreword for John’s Tottenham Hotspur Quiz Book. We are also delighted that John and his publisher, Apex Publishing Limited, have very kindly agreed to donate £1 to the Willow Foundation from every copy of this book sold, especially as we are both patrons of this fabulous charity. The Willow Foundation was founded by our great friend Bob Wilson and his wife, in 1999, when their daughter Anna died of cancer at the age of 31. It is a registered charity (http://www.willowfoundation.org.uk) dedicated to improving the quality of life of seriously ill young adults aged 16 to 40 throughout the UK, by organising and funding a ‘Special Day’ of their choice. Special Days give young people with life-threatening or life-limiting conditions a chance to escape the difficulties of their daily routine and share quality time with family and friends while pursuing an activity they can all enjoy. A Special Day could be a trip to a health farm or a visit to a pop concert; an afternoon of Premiership Football or a flight on the British Airways London Eye. The Willow Foundation’s aim is to be able to arrange a Special Day of their choice for every seriously ill young adult in the UK. Your contribution from the purchase of this book will help fund such Special Days. As we all know, Spurs is a club steeped in tradition and was founded in 1882 by boys from Hotspur Cricket Club; however, we won’t go into any historical detail here as John has a section in the book covering this very subject. Enough to say that, as players of the past with nearly 1,200 appearances between us, we both enjoyed much success at the Club and always appreciated the support of some of the most loyal fans in the country. This book is a trip through 113 years, from the Club’s beginnings to the current 2004-2005 Premier League season. There are over 1,000 questions in the book that will test and tease you for hours and just about every subject you can think of has been covered including: our Double season, FA Cup triumphs, League Cup triumphs, League Championship successes, managers, European triumphs, trivia, past legends and questions on the present-day side. We can both thoroughly recommend this book to all Spurs fans and, by buying it, you are also helping someone less fortunate than yourself. When I picked up The Tottenham Hotspur Quiz Book I thought it would be just another Quiz Book. However, to my surprise, the book is much more. It is a trip through the history of the club but done so in a quizzical way. 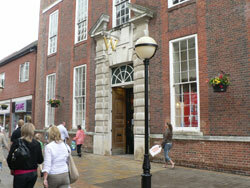 It teaches the reader about the club's history as well as tests and entertains you. 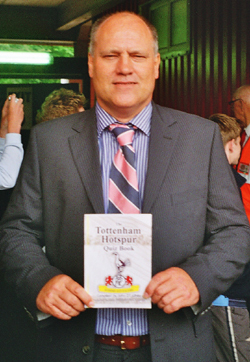 (Photo: Martin Jol holding 'The Tottenham Hotspur Quiz Book'). I will be taking the opportunity on our next away trip to test the boys on just how much they know about the club. Some of the questions certainly caught me out. 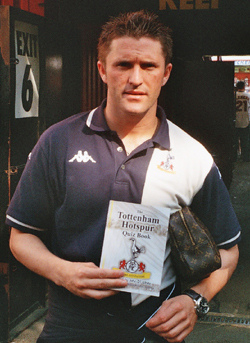 (Photo: Robbie Keane holding 'The Tottenham Hotspur Quiz Book'). 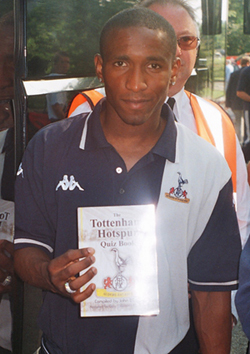 (Photo: Jermain Defoe holding 'The Tottenham Hotspur Quiz Book'). 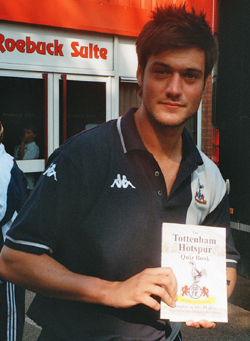 (Photo: Johnnie Jackson holding 'The Tottenham Hotspur Quiz Book'). 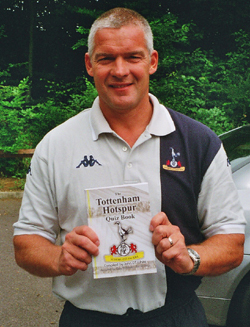 (Photo: Hans Segers holding 'The Tottenham Hotspur Quiz Book'). It's a must for every Spurs fan - great knowledge and a true test. I'm sure many fans will spend many hours debating these questions. It's good to find out so much about the club and the players from other era's. I'm sure it will be a great success. Tottenham Hotspur will always have a special place in my heart as I had a fantastic time playing for Spurs, playing in some fantastic matches and with some great players. This book has helped me remember some special times and has tested my knowledge of Spurs to the full, a must for any Spurs fan! I think it's a great idea that John White and Apex Publishing Ltd are raising money for charity with the sales of these books. This is a fascinating read for the dyed in the wool Spurs supporter. It will test the memory to the ultimate degree. What a fantastic idea. This book is a must for all Spurs fans because it has it all: the history, past players, the Glory Years and so much more. I thoroughly enjoyed it all. I found the Tottenham Hotspur Quiz Book very interesting. I would like to wish the book every success. I will always fondly remember my playing days at White Hart Lane and I am eternally grateful that the late, Great, Bill Nicholson signed me. During the 1960’s Tottenham Hotspur, along with Manchester United, was the club to be at. Together they dominated the decade in both the League Championship, FA Cup and of course in Europe. The Spurs fans will always hold a special place in my heart and just reading this book brought back so many wonderful personal memories. So I hope you enjoy this book and I am delighted that 2 former Spurs Legends, Pat Jennings and Gary Mabbutt, have agreed to contribute the Foreword for the book in support of the work they do for The Willow Foundation. 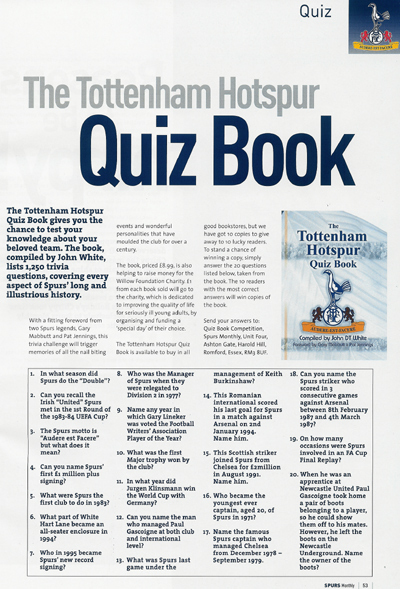 I really enjoyed 'The Tottenham Hotspur Quiz Book'. It will be a real collectors item and a lot of fun for all Spurs supporters and especially the historians of the older generation. A must for Spurs fans! A true test for any Spurs fan. 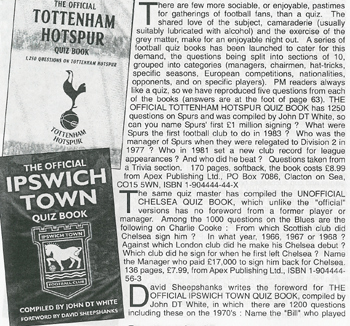 'The Tottenham Hotspur Quiz Book' is a great idea. I'm sure more will follow and it will be good fun for all. I can see more quizzes appearing on the long away coach journeys. Good luck and well done. Obviously Spurs fans will enjoy the book emensly. So much knowledge about the history and success of a famous club. 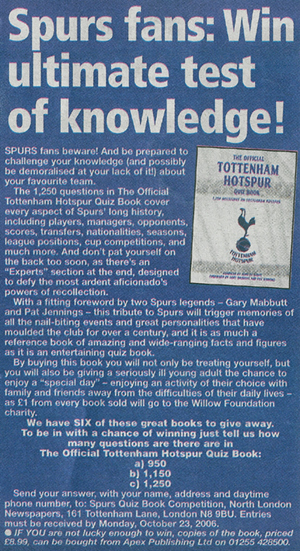 Good luck with the book from someone who is a Spurs fan and ex-player. It is always interesting reading about Tottenham Hotspur Football Club and this book really absorbs you. On behalf of all the seriously ill young adults who will benefit from the donations of John DT White and Apex Publishing Ltd, thank you both very much for this act of kindness. 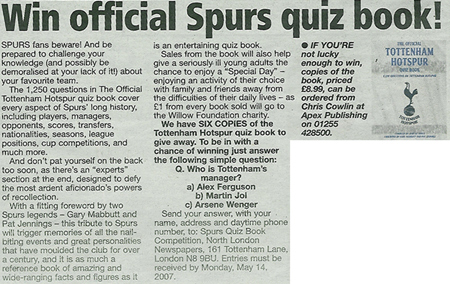 The Willow Foundation is extremely grateful for your generosity and wishes all the Spurs fans who tackle this first-class quiz book - good luck with the questions. This book is great fun and certainly would test the knowledge and memory of any Spurs fans. The Tottenham Hotspur Quiz Book is really good! I would challenge anyone to get all the questions correct. There are 1,250 questions in this book and it really tested my knowledge of Tottenham Hotspur, past players and matches. This book is a must for all Spurs fans regardless of what age they are. Questions to test the memory banks of young and old supporters alike. This quiz book is a must for all Spurs fans. The book is good. I played for Spurs from 1957 to 1968, part of which they called the 'Glory Years' - and it was a privilege. A must for any serious Spurs fan. Hours of informative fun and "frustration!" John DT White deserves a lot of credit for the incredible amount of research he's done. Packed full of statistics, trivia and little known facts this book should prove popular with all Spurs fans, regardless of age. I'm afraid I'm absolutely the worst person in the world to ask as having a terrible memory for this kind of thing I tend to avoid quizzes of this nature whenever I can. I've enjoyed reading some of the questions. I have passed the book onto my freind and ex-chairman, Douglas Alexiou who is thilled. The Tottenham Hotspur Quiz Book. A major boon for all quiz fans and Spurs fans alike, the Tottenham Hotspur Quiz Book will test even the most knowledgeable Spurs fans and provide a huge resource of facts and figures to add to any Tottenham Hotspur library collection. 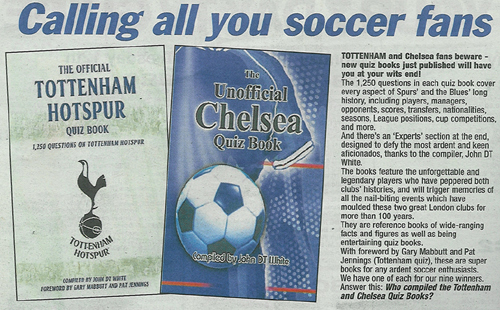 'The Tottenham Hotspur Quiz Book' tops the lot, fans will love it! Great variety of questions and great fun played on the way to the game. Everything you need to know about Spurs, and even more you didn't need to know! Spurs fans beware! And be prepared to challenge your knowledge (and possibly be demoralised at your lack of it!) about your favourite team. 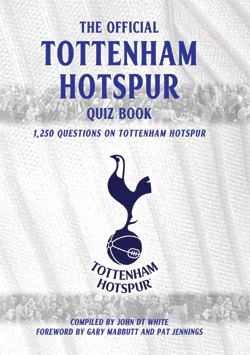 The 1,250 questions in this quiz book cover every aspect of Spurs’ long history, including players, managers, opponents, scores, transfers, nationalities, seasons, League positions, Cup competitions, and much more. And don’t pat yourself on the back too soon, as there’s an ‘Experts’ section at the end, designed to defy the most ardent aficionado’s powers of recollection. As a Spurs fan, I was in little doubt that I had an all-encompassing knowledge of all things Tottenham Hotspur matched by no one. It was evident after a couple of pages of The Official Tottenham Hotspur Quiz Book that like good old Sergei Rebrov himself, I could not live up to the hype. The book has been meticulously put together and covers every detail of the grand old club, big and small. A perfect companion while sitting in the icy stands before a winter’s game at White Hart Lane and a great addition to any coffee table for impromptu quiz sessions. Entertaining and educational – it’s rare those two words make happy bedfellows, but John White has managed it. 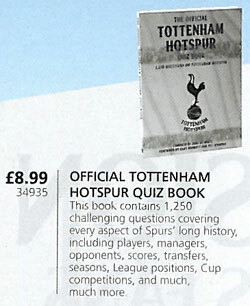 The Tottenham Hotspur Quiz Book - £8.99. A new book by John White. 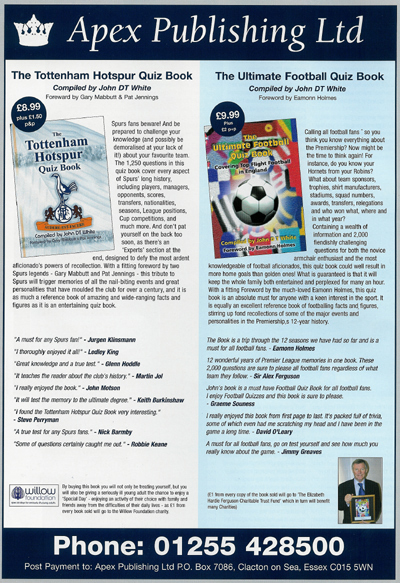 Read on for reviews by the famous and well known including past & present Spurs legends. £1 from every copy sold is going to THE WILLOW FOUNDATION (supported by Pat Jennings & Gary Mabbutt) which helps seriously ill young adults. 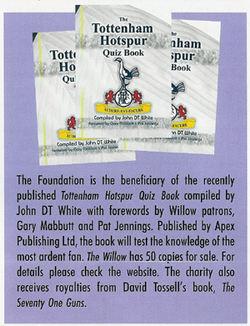 The Foundation is beneficiary of the recently published Tottenham Hotspur Quiz Book compiled by John DT White with forewords by Willow patrons, Gary Mabbutt and Pat Jennings. Published by Apex Publishing Ltd, the book will test the knowledge of the most ardent fan. The Willow has 50 copies for sale. For details please check the website. The Tottenham Hotspur Quiz Book gives you the chance to test your knowledge about your beloved team. The book, compiled by John White, lists 1,250 trivia questions, covering every aspect of Spurs' long and illustrious history. With a fitting foreword from two Spurs legends, Gary Mabbutt and Pat Jennings, this trivia challenge will trigger memories of all the nail biting events and wonderful personalities that have moulded the club for a over a century. The book, priced £8.99, is also helping to raise money for the Willow Foundation Charity. £1 from each book sold will go to the charity, which is dedicated to improving the quality of life for seriously ill young adults, by organising and funding a 'special day' of their choice. The Tottenham Hotspur Quiz Book is available to buy in all good bookstores, but we have got 10 copies to give away to 10 lucky readers. To stand a chance of winning a copy, simply answer the 20 questions listed below, taken from the book. The 10 readers with the most correct answers will win copies of the book. 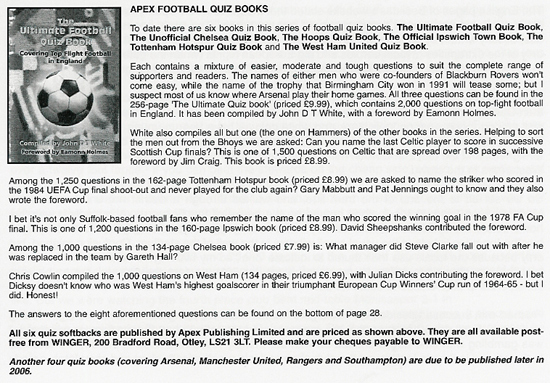 Send your answers to: Quiz Book Competition, Spurs Monthly, Unit Four, Ashton Gate, Harold Hill, Romford, Essex, RM3 8UF. 1. In what season did Spurs do the "Double"? 2. Can you recall the Irish "United" Spurs met in the 1st Round of the 1983-84 UEFA Cup? 3. The Spurs motto is "Audere est Facere" but what does it mean? 4. Can you name Spurs' first £1 million plus signing? 5. What were Spurs the first club to do in 1983? 6. What part of White Hart Lane became an all-seater enclosure in 1994? 7. Who in 1995 became Spurs' new record signing? 8. Who was the Manager of Spurs when they were relegated to Division 2 in 1977? 9. Name any year in which Gary Lineker was voted the Football Writers' Association Player of the Year? 10. What was the first Major trophy won by the club? 11. In what year did Jurgen Klinsmann win the World Cup with Germany? 12. Can you name the man who managed Paul Gascoigne at both club and international level? 13. What was Spurs last game under the management of Keith Burkinshaw? 14. This Romanian international scored his last goal for Spurs in a match against Arsenal on 2nd January 1994. Name him. 15. This Scottish striker joined Spurs from Chelsea for £2 million in August 1991. Name him. 16. Who became the youngest ever captain, aged 20, of Spurs in 1971? 17. Name the famous Spurs captain who managed Chelsea from December 1978-September 1979. 18. Can you name the Spurs striker who scored in 3 consecutive games against Arsenal between 8th February 1987 and 4th March 1987? 19. On how many occasions were Spurs involved in an FA Cup Final Replay? 20. When he was an apprentice at Newcastle United Paul Gascoigne took home a pair of boots belonging to a player, so he could show them off to his mates. However, he left the boots on the Newcastle Underground. Name the owner of the boots? 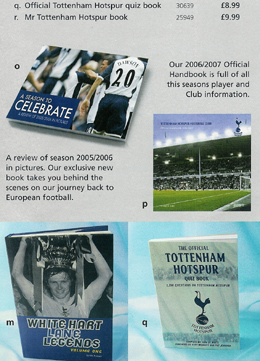 COMPETITION: Win a fantastic Spurs quiz book! Thought you knew your stuff about Spurs? Think again. The Tottenham Hotspur quiz book brings up facts you never knew existed about Tottenham, and is presented in an innovative and interesting way, and YOU could win a copy. To enter, all you have to do is send a Private Message (click here) to me with your answer to this question. Who was the last Spurs manager to win us the FA Cup? Winners will be picked at random from all of the correct entries. The competition closes on Friday 24th June, so get thinking! 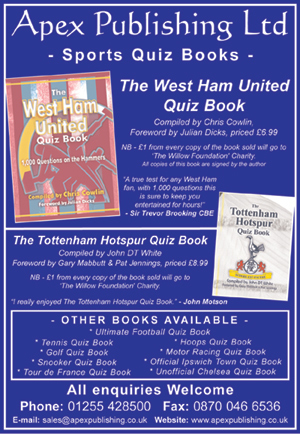 The book, entitled "The Tottenham Hostpur Quiz Book" is compiled by John DT White, and contains a foreword by Spurs legends Gary Mabbutt and Pat Jennings. It is priced at £8.99 and is available from all good bookshops and some rubbish ones as well. The publishers of the book, Apex Publishing, have very kindly agreed to donate £1 from every book sold to the Willow Foundation, which is a registered charity dedicated to improving the quality of life of seriously ill young adults aged 16 to 40 throughout the UK. It comes personally recommended by me and is well worth a look. For more details on the book phone Apex Publishing - 01255 428500. From every book sold, £1 will go to the Willow Foundation, a charity, founded by former Scotland keeper Bob Wilson and his wife Megs in memory of their daughter, Anna, who died from a rare cancer. The chance to swot up on your Tottenham history. Enough to keep you and your mates entertained on many a winter's day. SPURS FANS: WIN ULTIMATE TEST OF KNOWLEDGE! NEW BOOK ON SALE - Currently on sale in our club shops. 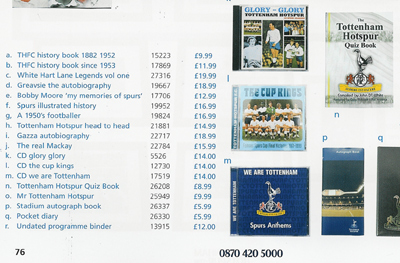 'The Tottenham Hotspur Quiz Book' will certainly test even the most ardent fan of Spurs. Be prepared to challenge your knowledge (and possibly be demoralised at the lack of it) about your favourite team! The 1,250 questions in this quiz book cover every aspect of the Club's long history, including players, managers, opponents, scores, transfers, nationalities, seasons, League positions, Cup competitions, and much more. And don't pat yourself on the back too soon, as there's an 'Experts' section at the end, designed to defy the most ardent aficionado's powers of recollection. The book is priced £8.99, with £1 from every book sold going to the Willow Foundation charity. Okay Tottenham Hotspur are not doing as well as they might in the Premiership. Gone are the days of the league and cup double and the north London club are now fighting for their very existence. 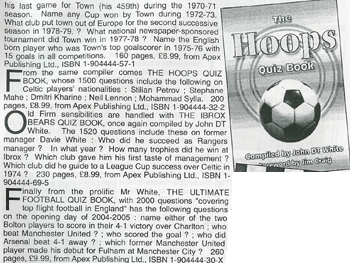 John DT White’s quiz book on the Spurs contains more than 1,200 questions. There are recommendations from Jurgen Klinsmann, Robbie Keane and the legendary sports commentator John “Mottie” Motson, who know doubt will keep it close to hand when he is working at White Hart Lane. John again is showing remarkable generosity in donating £1 to the Willow Foundation a registered charity dedicated to improving the quality of life for seriously ill young adults throughout the UK. Special Days give terminally ill youngsters and those with life limiting conditions a chance to escape, if only for a day, from their daily routine. The Special day can be anything from an afternoon of Premiership Football to a trip on the London Eye. Pages of questions on Jimmy Greaves, Ossie Ardilles and Martin Chivers and many more. This is not only a book for Spurs fans and question masters it is good reference material for lovers of the beautiful game. Last word as usual from “Mottie”. 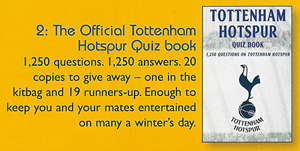 “I really enjoyed The Official Tottenham Hotspur Quiz Book. It will be a real collectors item and a lot of fun for all Spurs supporters and especially the historians of the older generation”. 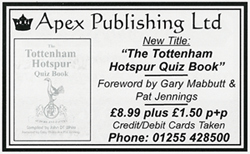 * The Official Tottenham Hotspur Quiz Book compiled by John DT White with a foreword by Gary Mabbutt and Pat Jennings is published by Apex; ISBN 1-904444-44-X. 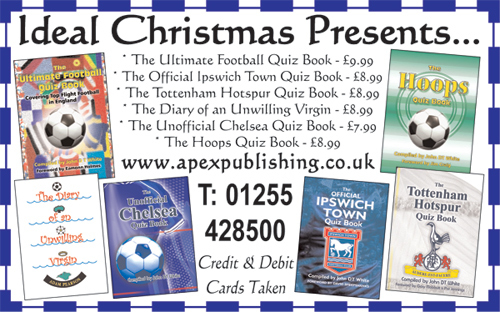 A great quiz book which will entertain Tottenham fans of all ages. "The Tottenham Hotspur Quiz Book"
The "Tottenham Quiz Book" comes very highly recommended, with an excellent foreword by Pat Jennings and Gary Mabbutt, and well over 100 pages full of amazing facts and statistics that perhaps you never knew! Finally! A book of brilliance! The perfect Spurs bible to always carry with you at all football adventures. A fine blend of trivia and statistics for true Spurs fans. Highly recommended. 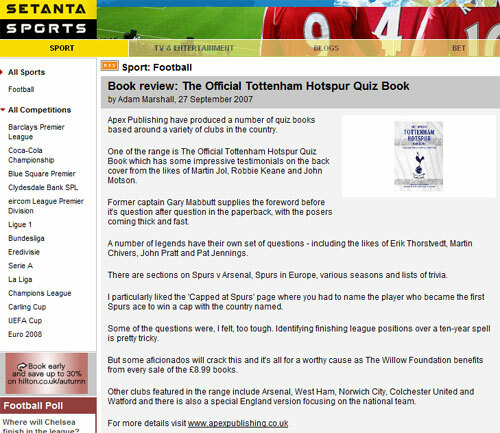 The Official Tottenham Hotspur Quiz Book was featured (and a competition run) on Swansea Bay Radio 102.1 FM, on 'The Jay Curtis Show'. I think this book is a tope quiz book. 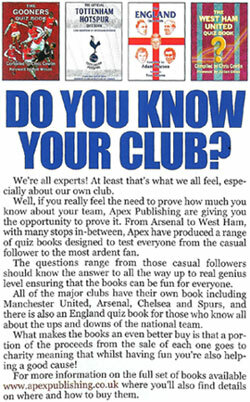 Forget those quiz related TV shows - there's only one world class quiz book and that’s the Tottenham Hotspur Quiz Book. It's great for the old and new Spurs fans - it's brilliant! Clearly laid out, with good size font. Good fun for home entertainment as well as for pub quizzes. It is good fun to test your knowledge of Spurs and also learn about the history of the club and about the older players. about Tottenham Hotspur as you claim to! All members of Spurs Australia will be delighted to have the Spurs Quiz Book in their collection, to remind us of all the facts and figures of our great football club. A must for EVERY Spurs fan, this book covers questions from 1882-2005. This book covers questions from key matches in Spurs' history to great players who have graced 'The Lane'. A great book to have while travelling to home and away games. I enjoyed reading this book very much, certainly filled a few gaps in my memories of 50 years of Spurs supporting. It will be read many times in the future. The layout of the book is great, and the range of sections is better than other quiz books. This book is certainly a great read! A great book for a great club! An excellent book for all Spurs fans, many, many hours of enjoyment! I really enjoyed this quiz book, a great test for any Spurs fan! This book covers everything in the history of Tottenham Hotspur, a great test - go on test yourself and see how much you know about your team! Spurs Canada will enjoy the Spurs Quiz Book as it will be the source for Spurs trivia contents amongst our members for Spurs paraphanalia. The book will be invaluable for this spirit activities. 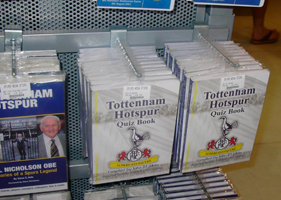 'The Tottenham Hotspur Quiz Book' on sale at Tottenham Hotspur Super Store. 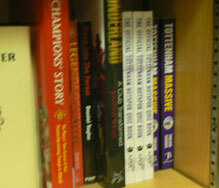 'The Official Tottenham Hotspur Quiz Book' on sale at Waterstone's, Colchester (Culver Square).